Keeping things simple has been the benchmark for Carter Hall Pipe Tobacco since 1895. This high-quality tobacco has been loved and cherished by pipe enthusiasts across the country for its non-aromatic, mild bodied blend of fine Burley and flake-cut Virginia tobaccos. Each pouch or can of Carter Hall Pipe Tobacco is packed full of high quality tobacco that is air-cured and ribbon cut. For pipe smoking enthusiasts, Carter Hall is easy to pack, and once ignited, this premium pipe tobacco is light giving with a slightly sweet nutty flavor that provides a cool taste and mildness that’s ideal perfect for an all-day smoke. Smokers Discounts online pipe tobacco shop offers Carter Hall Pipe Tobacco as a straightforward and enjoyable smoke at an affordable price. 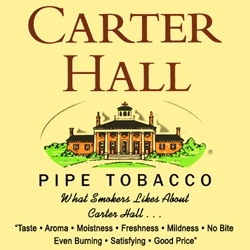 Carter Hall Pipe Tobacco is produced and distributed nationwide by John Middleton, Inc. USA. Carter Hall Pipe Tobacco is available and ready to ship. If you haven’t tried this pipe tobacco, you’re missing out! Here at Smokers Discounts we offer you a great way to relax and enjoy a great quality smoke at an inexpensive price. Carter Hall Pipe Tobacco is an excellent choice for your pipe smoking needs. Our online tobacco store was created to make it easy and affordable to buy pipe tobacco online. Call us for more details!